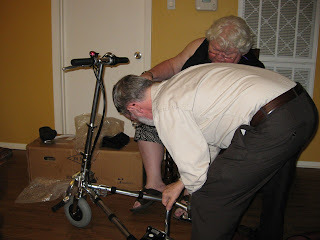 My sister Kay ordered a TravelScoot, and it arrived while she was in Baton Rouge. That's my husband Alan kneeling on the floor. He's in charge of opening all packages at our house. "This is the seat back." 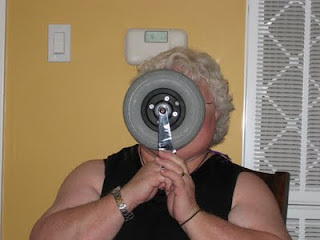 "And this is my front wheel." That's the sealed lead acid battery in the green case. The front wheel is now attached. The u-bar that supports the seat is attached. 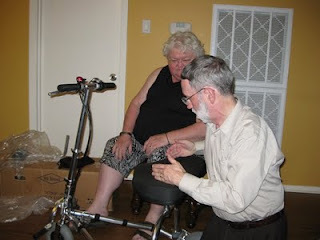 Alan and Kay, having a discussion about putting the seat on. "Now this is where you sit..."
Now my sister Rae has gotten in on the fun. 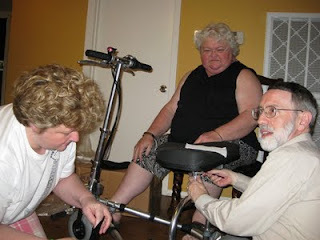 They're figuring out how to tighten the seat so it doesn't swivel. Alan says, "You want me to do what?!" Isn't that some beautiful curly hair she's got? 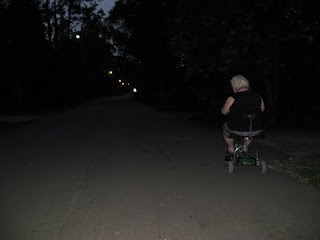 And here we are out on the street at dusk, eager to feel the wind in our hair. 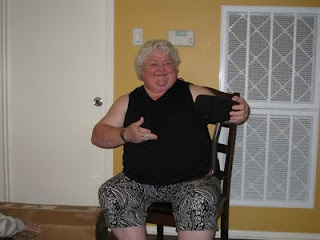 Leavis Corene Henthorne Morris, who never saw a flower she didn't want to plant a cutting from in her yard, died last Saturday, September 19, 2009, at Ollie Steele Burden Manor, Baton Rouge. Born in Bauxite, Arkansas on June 28, 1927, the fifth of thirteen children of Lillian Maude Fowler Henthorne and Samuel Glover Henthorne, she spent her childhood on the family farm in Valliant, Oklahoma. She worked the land alongside her father and attended Lone Star School, a schoolhouse he built on the family property. While working as a "Rosie the Riveter" during WWII at an Arkansas defense plant building detonators, she met her future husband on a sidewalk in Little Rock. It was love at first sight. She married Andrew George "Sam" Morris in Oklahoma City on May 28, 1946. In 1957, with 3 children in tow, they loaded their possessions on a cattle truck in Waco, Texas, and moved to Baton Rouge to fulfill the promise of a brighter future. 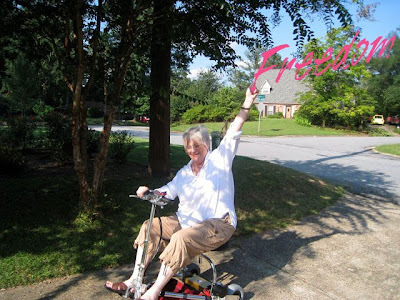 Stubborn and resourceful, whether learning as a young woman to drive the car while her husband slept, fighting breast cancer for 22 years, or carrying a hacksaw in her walker (for those pesky gardening emergencies), she approached life with gusto. No matter what you did for her she'd say, "That's the best I ever had!" She read her newspaper from cover to cover and when she didn't know how to do something, she headed to the library to check out a book about it. She loved her five children unconditionally. If you knew her, you surely knew all about their accomplishments too. To her children she gave her tenacity and strength (and the ability to move the occasional mountain). Her crystal blue eyes and bright personality brought sunshine to friends and family. She loved to sing (You Are My Sunshine was her favorite), and when life threw something difficult her way she'd say, "We don't get to decide. God decides." Mrs. Morris was preceded in death by her parents, her husband, her son Samuel Ray Morris, brothers Roscoe Nathaniel, Lawrence Mancel, Samuel Glover II, Edward Fowler, Junior (stillborn), Elijah and Clarence Ray Henthorne, and sisters Okema Beatrice Henthorne Luna and Mary Elizabeth Henthorne Nowell. Survivors, also known as the 'Krewe of Leavis', include daughter Georgia Morris Walker and husband Jimmy, Sunshine; daughter-in-law Shannon Morris, Tampa, Florida; daughter Kay Morris Miller and husband Ivan, Englewood, New Jersey; daughter Elizabeth Morris Fisher and husband Alan, Baton Rouge; daughter Rae Lyn Morris and partner Kelli Patin, Port Allen; grandchildren Shane, Jason and Ashlea Walker, Beau Morris, Terri Kirkland, Ben Miller; eleven great grandchildren; sister Dorcas Jane "Dot" Henthorne Unruh and husband Ken, Bloomburg, Texas; brother Paul Henthorne, Idabel, Oklahoma; and sister Maudie Pearl Henthorne, Norman, Oklahoma. These past 2 weeks have been a blur, and if you've been wondering why I haven't been posting, this will explain. My mother reached the end of her 22 year journey with breast cancer on September 19th. 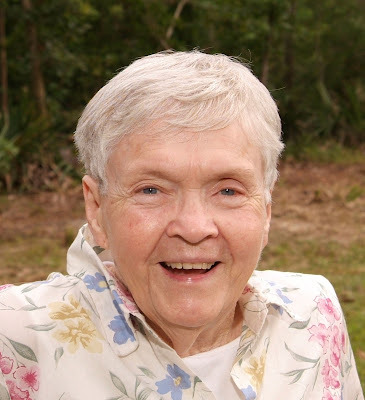 I am posting her obituary too, and if you knew her I hope it'll make you smile, and if you didn't, I hope it will make you wish you had. 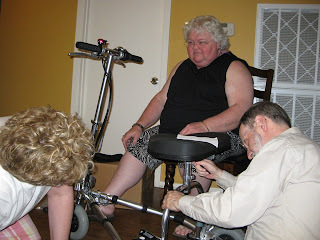 When she wanted to do something, nothing stood in her way, regardless of her health or mobility issues. 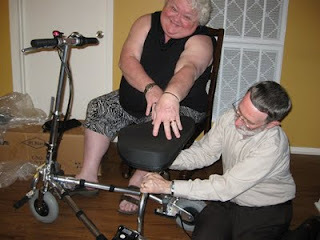 I also hope this post will reach out to those of you who could benefit from a mobility aid, but are hesitant to use one. My TravelScoot enabled me to be with my mother the last week of her life much more than I could have managed without it. 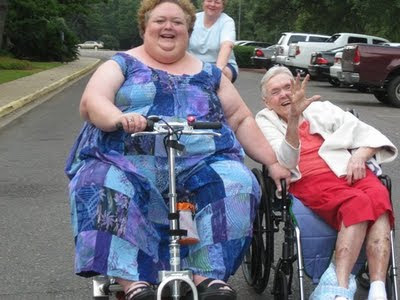 I didn't have to be concerned with where I parked, how many trips I made through her large nursing home, or where I needed to go to take care of the arrangements afterwards. I truly do not know how I would have managed without it. 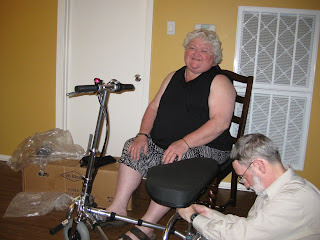 This photo was taken in June when my sister Rae Lyn and I took our mom out for a day on wheels. Rhonda, our photographer, was on a TravelScoot too. Rofl, doesn't look like a vrrrooooooom moment does it? Half throttle, feelin' the breeze, loving it! FREEDOM! Coming out of the darkness. "Elizabeth, I'd love it if some were added to your blog. 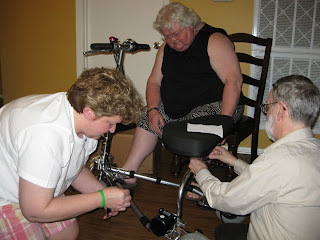 Not only would I get to share the absolute delight the SCOOT has brought me, I'd consider it an honor, particularly since your blog, more than anything, convinced me to "gamble" and get one. BTW, someday, I should talk with you about my insurance experience, not entirely hopeless, at least for others in the future. I am really glad I have met you, I think you might understand how a little machine could bring one out of the darkness." Yes, I absolutely do understand how a little machine could bring one out of the darkness. Thank you so much for sharing your experience with us. We look forward to seeing more! 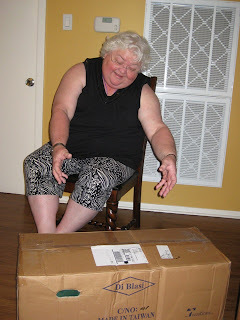 I received my 11.1 gallon size TrolleyBasket last week and took it out shopping on Friday. 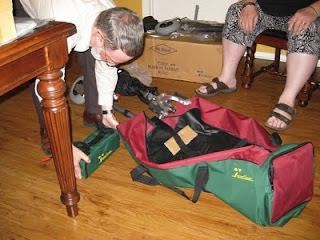 I also received an 8.5 gallon TrolleyBasket with only 2 swiveling wheels to test drive for Peter at TrolleyBasketUSA. I know some of you are still thinking about getting a TrolleyBasket so I hope this posts helps you in making your decision. 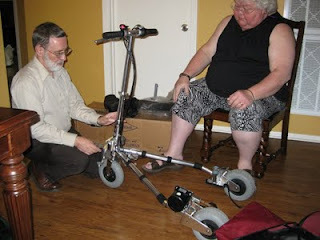 First of all lets talk about the 8.5 gallon size with 4 swiveling wheels. I have had this TrolleyBasket for a while now and it has served me well. I live alone with a dachshund so the amount of groceries I have to buy isn't overwhelming. Keep in mind that I also use 2 canvas totes along with the TrolleyBasket. I put heavy items in the TrolleyBasket and lighter weight items in my totes. I have not had any issues with the 8.5 size, it pulls very easy empty and full and it fits in the trunk of my car even when loaded over the rim of the basket. My test drive of the 8.5 gallon size TrolleyBasket with only 2 swivel wheels went well. It was just as easy to pull empty and full. There was only one real difference that I felt while pulling it and that is that it isn't as easy to get it to fall inline behind me when it is full; when I am shopping and I come to a crowded space I put my arm that is pulling the TrolleyBasket behind me so the basket will fall in line and I can fit through crowded spaces. 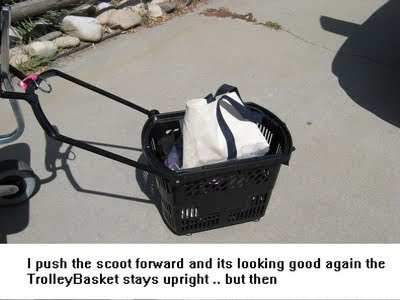 The 4 swivel wheeled basket easily glides over behind me with very little pressure from my hand to the handle of the cart. 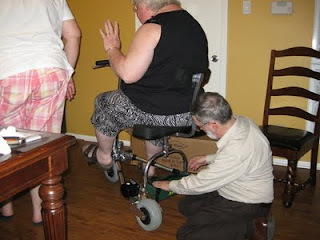 The 2 swivel wheeled one took about twice as much force to get it back there, not really a big deal but something to keep mind if you have arthritic hands and arms like I do. Here is the short video we made using the 2 swivel wheeled 8.5 gallon TrolleyBasket. At the end of the video is a shot of the 11.1 TrolleyBasket full and in my trunk. The trunk lid closes with the 11.1 size inside. 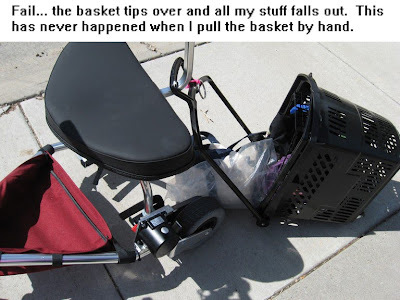 One note on both versions (2 and 4 swivel wheeled) of the 8.5 gallon size basket, when it is empty it is very easy to have it tip forward when the long handle is extended and you are not holding the handle. Once there is an item in the basket it isn't as tippy. The 11.1 gallon size is a heavier basket so it is better balanced and this doesn't happen with it. The 11.1 size also has larger wheels and that helps with it not tipping forward when pulled over cracks and door thresholds. If you noticed in the video when I leave the store the 8.5 TrolleyBasket catches in a very large crack at the doorway and tries to tip forward, it was very easy to keep it from tipping all the way but if you had a loose grip on the handle it could have dumped. This is the first time I have been at that store and I was unaware of the large crack at the door. The 11.1 did not have that problem when I left the store with it. The 11.1 gallon basket was great and I highly recommend this size. I was worried it would be too large to fit in my trunk when it was full, that is not the case. The 11.1 is easy to pull even when full and I had easily 60 pounds of stuff in it on its first shopping trip out. I still took my 2 canvas totes but did not have to put near as much in them. I used one tote for bread and buns and the other for produce. My TravelScoot battery did notice the difference however. My battery had been sitting all week without using it and without charging it. When I left the checkout pulling the 11.1 gallon full of groceries with 2 totes hanging on the scoot I was going at a fast clip to the other end of the store toward the doors and the Scoot yellow battery light flashed and I let off the throttle and coasted. When I gave it throttle again it flashed yellow at me so I gave it half throttle and it was back to green light and it stayed green all the way to my car. I think it was the extra weight I was pulling and the fact that before I did my "big shopping" I had made a fast test trip around the store with the 8.5 two swivel wheeler so my friend could take a few quick video shots then I went back in with the 11.1 gallon size to do my real shopping. I was in the store for 2 hours. I had not been in this Walmart before and for some reason this one is not arranged like the others I have been in so I was having a hard time find things which increased my time inside and I did a lot of fast scooting all over the store. Here is the 8.5 (on left) vs the 11.1 ( on right) holding the same items so you can see the difference in available space. 20 can box of pop, 1 gallon of bleach, 96 oz container of laundry detergent and a 75 wipe size of Redi Wipes. "This weekend I hit the outlet mall. I was able to park very close to Lane Bryant but when I wanted to shop the other end of the mall, I wasn't so lucky. Silver and I went to town. When I wanted to go into a store, I still got off. Most of the time someone came to either hold the door or get the scooter inside for me. The stores were small enough that I walked around them. THEN I went to Cabala's; the acid test. The doors were open because there were so many people shopping (tax free weekend for guns and ammo). I'd been wanting to go there because everyone said it was more than just a sporting goods store. It was so great to be able to go see everything. The taxidermied animal exhibits were fantastic. I can understand why my grear nephews love the place. I did pretty well. I was able to make some fast stops when people cut right in front of me. 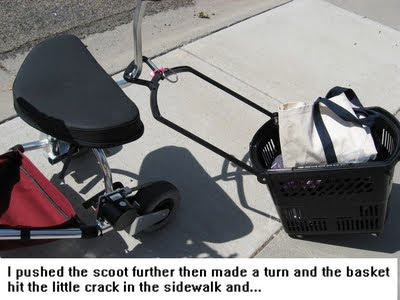 It was like pushing a basket, be careful at turns." Seeing Peggy talk about getting through doors gave me the idea for this post. How do you handle doors when you're on your scoot? 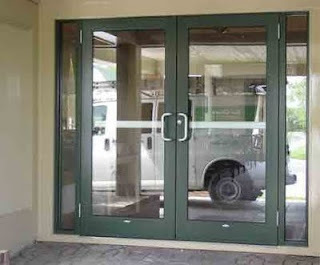 If it's not an automatic door, do you get off and walk through the door? The place I most often have to deal with doors is at work. I'm able to open the doors while I'm sitting on my scoot and just drive through. The door into the bathroom feels like it weighs about a thousand pounds and is 100 ft. tall, so it's the biggest obstacle I have, but I'm strong and my arms are long enough that I'm able to push it open. I'm also able to open the doors into the building from my scoot and just motor through them. If someone is nearby they're always eager to assist, but it's nice to know I can do it by myself too. What kind of successes/failures have you had with doors? When we went to the federal courthouse building last week I was surprised to see that there was a separate door for a handicap entrance, one they had to open from inside. The "regular" door had a step up to it. At the mall I go to the entrance with the automated doors. I haven't found a door yet that I don't fit through while I'm on my scoot. Any cruisers out there? (Oh Bee...... stop petting Flat Jeter and talk to us!) Were you able to drive through the door of your cabin? I woke up Saturday having a bad knee day and without my TravelScoot I wouldn't have been out running errands because I could hardly walk. Alan and I started out at Home Depot shopping for a new toilet for my bathroom. We zipped in and before long we were finished. It was pouring rain when we left so the very helpful staff at checkout gave Alan an umbrella to use to get to the car and sent me to the lumber department to exit the store so he could drive under the covered area and keep me and my scoot dry. After that we went to the Sprint store to shop for phones. I used my scoot here too because it enabled me to have a place to sit while I comfortably shopped the store for a new phone. I'm now the proud owner of an Earth Green (in more ways than color!) Samsung Reclaim. Alan's is Ocean Blue. It's made from corn! 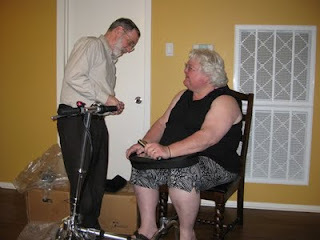 1st thanks for this Blog, the info & caring shown is a blessing, and more than anything else I read, helped me define my needs and settle on the SCOOT. 2nd, I don't know where else to address this so I hope it is ok to ask a question here. 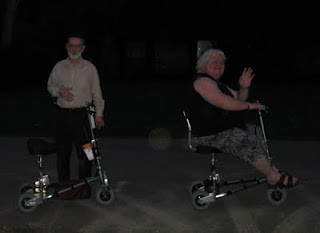 I have MS, and expect to recieve my freedom in the form of a TravelScoot about Wednesday. I am curious if you think the TROLLEY BASKET, with that odd extra handle at the end of the long one, could be attached over the backrest supports as luggage sometimes is? B'racha, I did some experimenting with the 8.5 gallon TrolleyBasket and the TravelScoot. 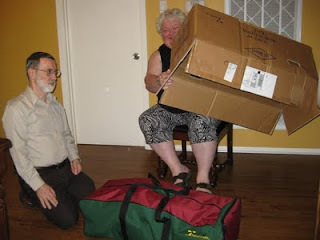 I have sent the pictures to Elizabeth to post so you can see how it fits. 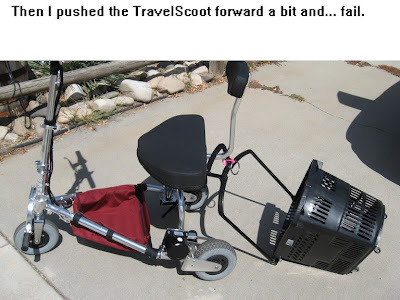 To answer your question; yes, you can loop the TrolleyBasket handle on the backrest stem of the TravelScoot by removing the little black top of the backrest and sliding the TrolleyBasket handle over the top then replace the backrest top onto the stem. But the TrolleyBasket was unstable to pull and tipped forward dumping it. The TrolleyBasket doesn't dump like that when I am pulling it by hand. 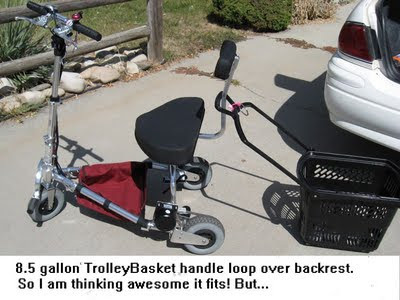 Maybe I can think of a way to make the handle of the TrolleyBasket more stable on the backrest stem of the TravelScoot. 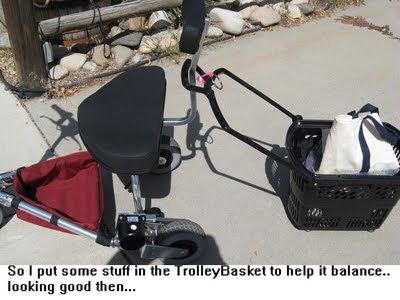 I think if the handle couldn't slide up and down the backrest stem, it would keep the TrolleyBasket from tipping. I will try the larger TrolleyBasket too when it comes, its handle will probably be higher as it is larger. I will keep you posted. Thanks, Cynth, it is the larger one that I am particularily interested in as it will free me from depending on help with a grocery cart to my car. Welcome B'racha! We've got a nice TravelScoot community going here, and it makes me happy to know that you think of us as caring and as a blessing. I can't wait to hear about your adventures with your scoot. You might also want to add me as a Facebook friend (elizabeth@ifisher.com), because we usually have a TravelScoot conversation going on over there too. 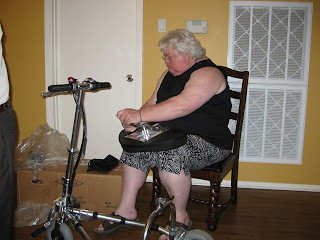 I can't wait to see the horn you put on your scoot!